I have had scones on my mind for sometime, but just couldn’t find the right recipe to bake some. When looking through some recipes I had pinned on Pinterest, I found a recipe that I had forgotten about. 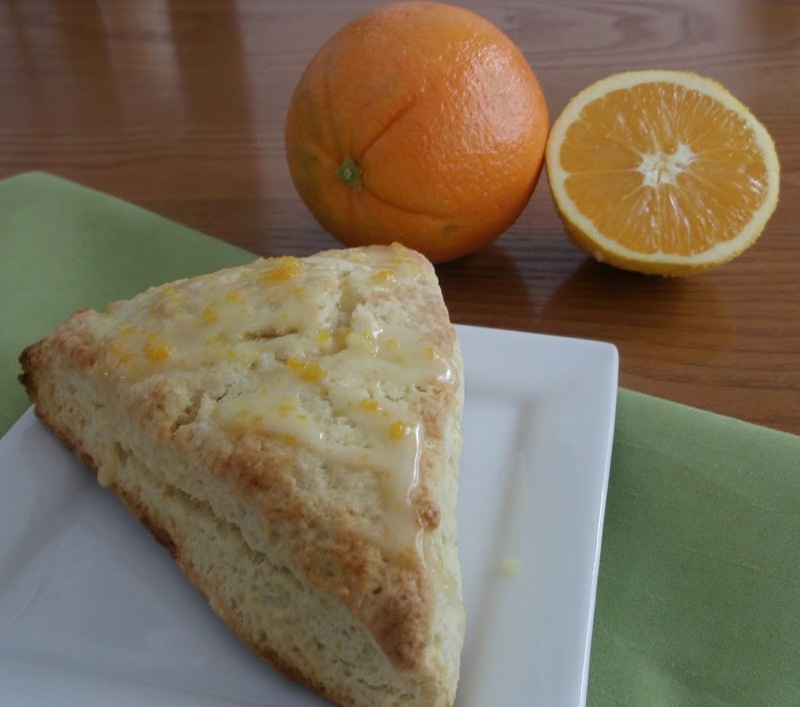 Orange scones are perfect to bake in the winter, with the abundant supply of oranges in the store at this time of year. I have made orange cookies and orange sweet rolls before, so I think it is funny that I would not have thought of using oranges in some scones. In the past I have made lemon scones and the family loved them, but I think that these orange scones have been the favorite so far. Not only do these scones have orange juice and zest in them, but they are brushed with orange juice and a bit of sugar before they are baked, and after they are baked they are drizzled with a sweet orange glaze. 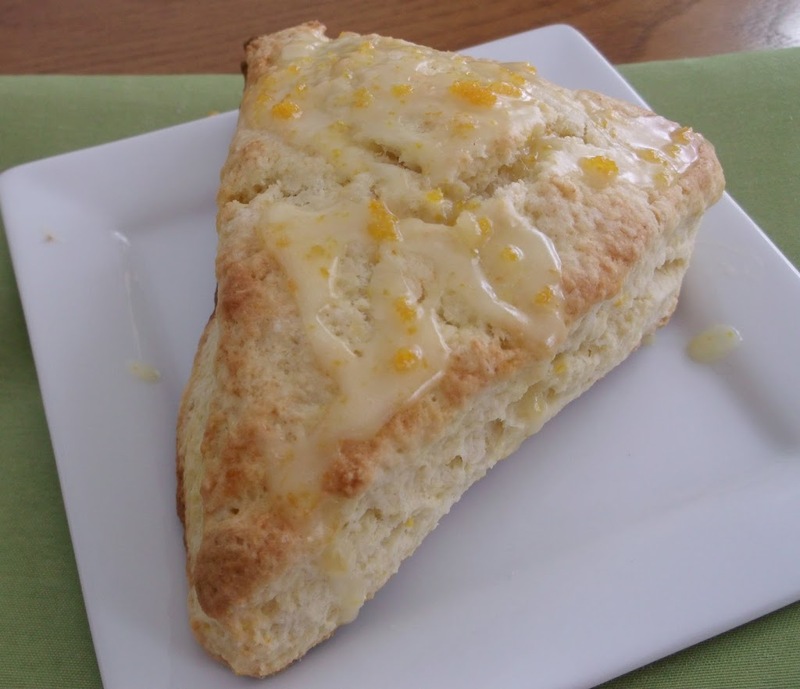 Leaving you with a delightful scone that is bursting with orange goodness. We enjoyed these scones so much that I will be baking a double batch this weekend. Preheat the oven to 425 degrees F. Lightly grease a baking sheet and set aside. In a bowl combine the flour, baking powder, salt, and sugar. Add the butter to the flour mixture and cut the butter in with a fork until the mixture is well blended and mixture resembles coarse cornmeal, with the butter pieces about the size of a pea. In a separate bowl, whisk together the eggs, milk, cream, orange juice, and orange zest. Fold the wet ingredients into the dry ingredients until they form a ball. Transfer the dough to a lightly flour counter top and shape into an 8 inch circle. With a pizza cutter or sharp knife cut the dough into 8 wedges. Place the wedges on the prepared baking sheet. Combine the orange juice and sugar stirring until the sugar dissolves. Brush each scone with the orange juice mixture. Place scones in the oven and bake for 14-16 minutes or until lightly browned. Place on cooling rack to cool. While scones are cooling make the glaze by mixing the powder sugar, orange juice, and zest until smooth. While scones are still warm drizzle glaze over each scone. Oh, yeah…I can see why these would be your favorites! I love that you added a glaze! 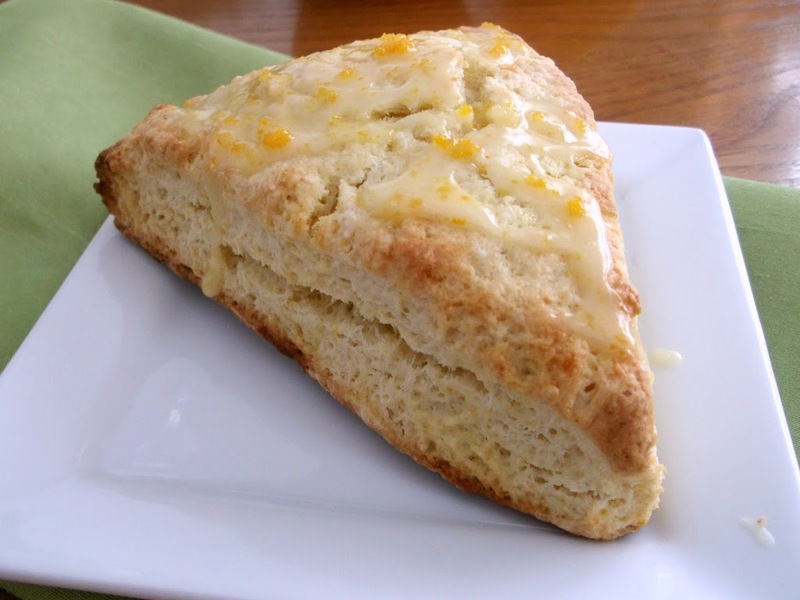 I love orange anything, but have never made orange scones. Thanks for the recipe! I love scones… these look terrific. I don’t believe I’ve ever had an orange scone, but I really like the idea! And I’m craving citrus big time at the moment (probably as an antidote to all that holiday sugar I’ve ingested!). Lovely recipe – thanks.